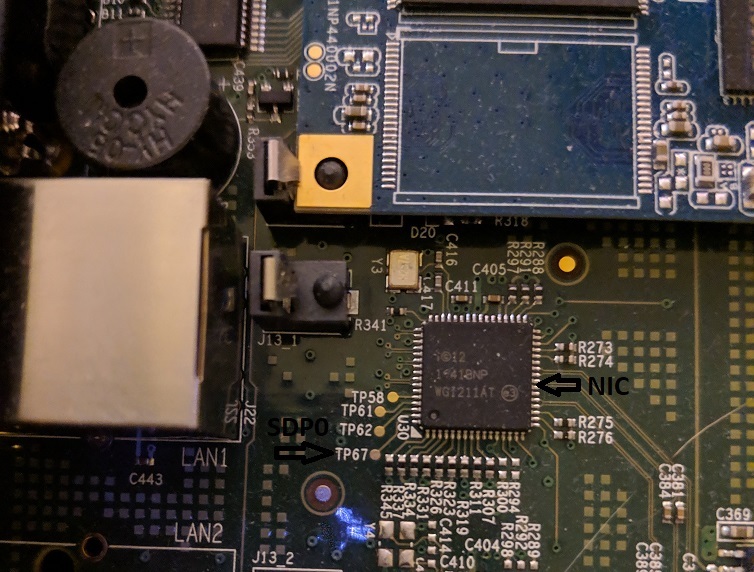 For more information on the software defined pins, I looked at the i211AT datasheet, "The I211 has four software-defined pins (SDP pins) that can be used for IEEE1588 auxiliary device connections" and "Upon a change in the input level of one of the SDP pins that was configured to detect Timestamp events [...], a time stamp of the system time is captured [...]"
In other words, this NIC can take a GPS PPS input and provide timestamps against its local clock. This is the same clock that is used to timestamp NTP and IEEE1588/PTP packets. Having the GPS PPS and the packet timestamps using the same clock greatly reduces the time measurement errors. Having the timestamps be captured in hardware eliminates the interrupt latency time measurement errors. Another thing I wanted to know from the datasheet was: what voltages was it expecting? So this is just expecting 3.3 volts, which is convenient because all the GPS modules I have are 3.3V. Those are some tiny test pads (TP67 & TP69). I practiced soldering small things first. After soldering the wires to the test pads, I also put two wires onto nearby ground pads. I put some hot glue on top of my wires in the hopes that they would be less likely to break. There's a nearby hole in the case already (designed for wifi antennas), so I routed my wires through that. 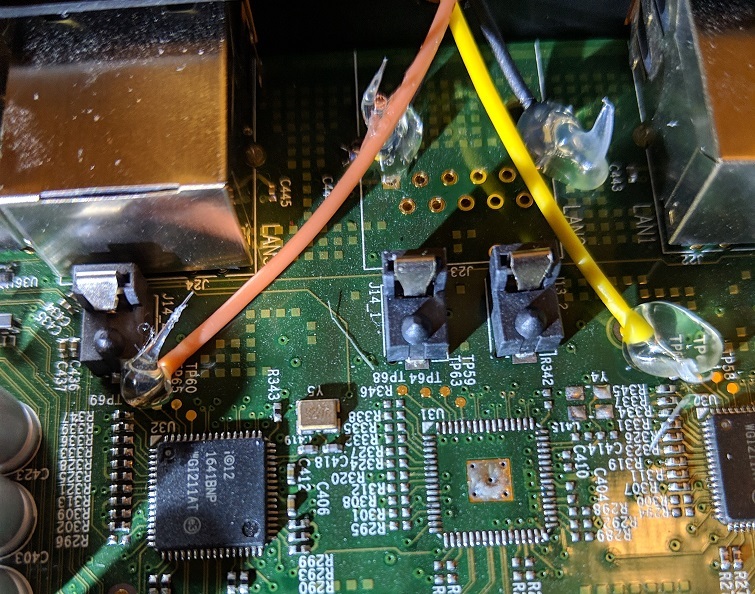 I connected the GPS PPS to the orange wire on LAN3, connected the GPS ground to the APU's ground, and used USB serial to power and communicate with the GPS module. I'll skip the OS install, because that's already well covered elsewhere. I went with Fedora 29.